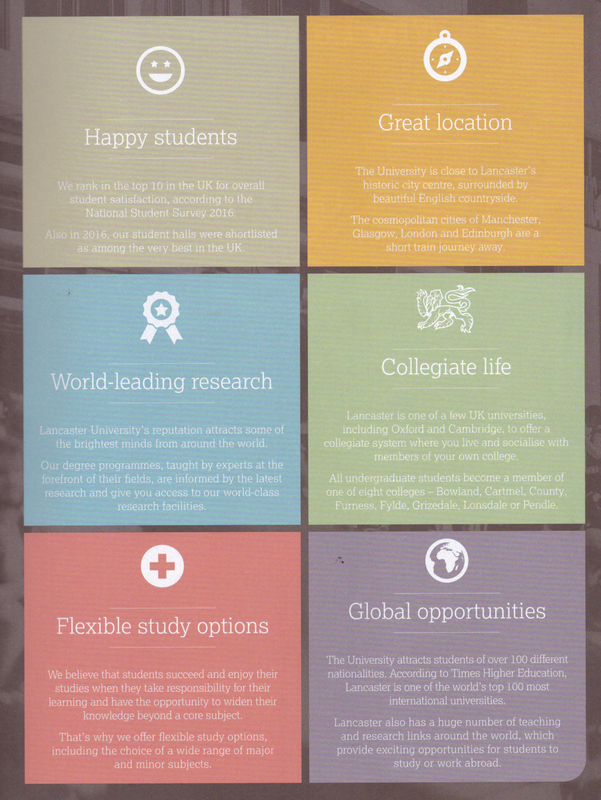 Lancaster University is a collegiate university located in the North West of England. The University is a proud member of the N8 Research Partnership: an association of the eight most research intensive universities in the North of England. Founded in 1964, Lancaster University has firmly established itself among the UK's elite universities with world leading research, excellent teaching and career prospects and a beautiful campus with award-winning facilities. 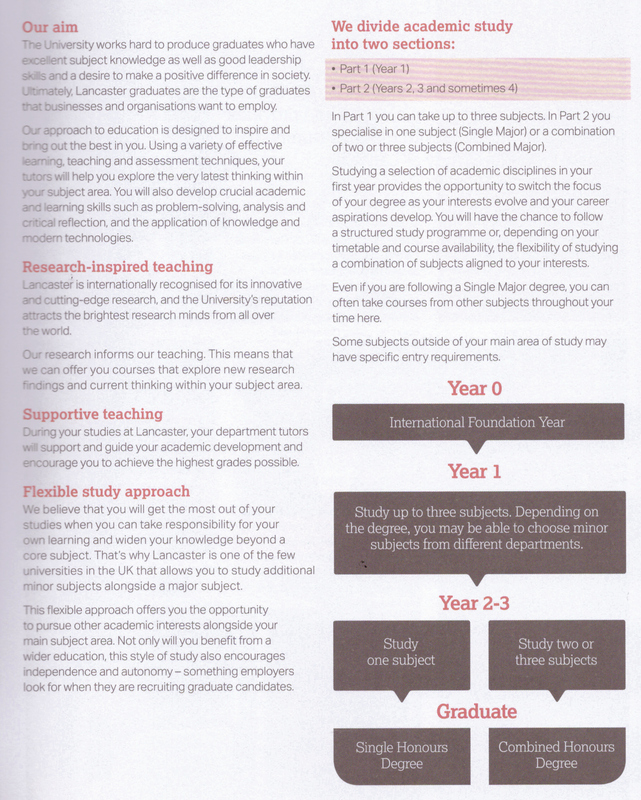 Lancaster University is an internationally highly-ranked leader in the provision of inspiring teaching and research. 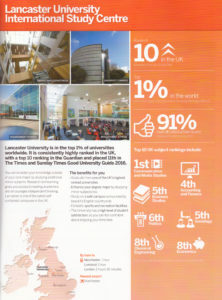 The growing reputation of Lancaster University is reflected by its consistent high rankings year-on-year in each of the UK’s major university league tables – the Guardian (8th), the Complete University Guide (9th), The Times/Sunday Times (11th) and the THE Students Experience Survey (15th). In addition, the University was announced to be the highest placed UK University in the Times Higher Education 100 under 50 ranking of the world's best young universities. Ranked 10th, Lancaster is the highest ranked of only 14 UK universities to be listed. 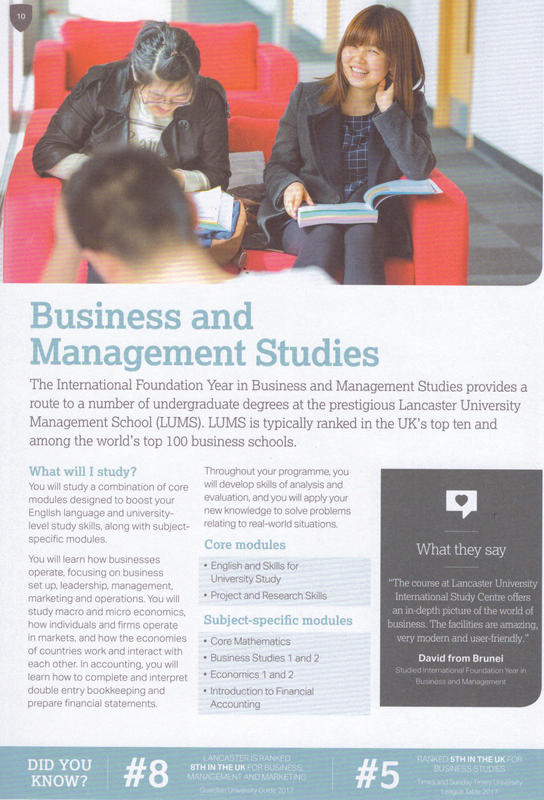 In international league tables, Lancaster consistently ranks in the top 1% of universities globally. 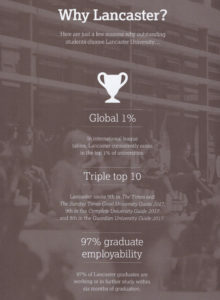 Academically it is one of just a few universities within the UK to have a collegiate system, home to nine colleges overall, eight for undergraduate students and one for postgraduates. Accounting & Finance (9th), Art & Design (9th), Business & Management Studies (9th), Communication & Media Studies (3rd), Drama, Dance & Cinematic (5th), French (4th), General Engineering (8th), Geography & Environmental Science (10th), Iberian Languages (5th), Linguistics (6th), Marketing (2nd), Mathematics (10th), Mechanical Engineering (7th), Philosophy (8th), Politics (9th), Social Work (3rd) and Theology & Religious Studies (8th).